Len’s spirit and courage which combined with his natural ability made him an outstanding performer for club, county and province. As a player and a coach, Len Gaynor has undoubtedly been the club’s greatest ambassador. In both roles, he has served Kilruane MacDonaghs and Tipperary with distinction. Len played his first juvenile game in 1955, and in a playing career that lasted an incredible 34 years — with the number one jersey on his back he played his last game for the club in the Junior ‘B’ championship against Moneygall in 1989. In 1959 he captained the MacDonaghs juvenile team that defeated Ballybacon/Grange in the county final. Having completed his primary education in Kilruane N.S., he attended St. Flannan’s and in 1961 led them to victory over De La Salle Waterford in the Dean Ryan Cup final. In 1962 he made his debut for the Tipperary minors against Limerick. That team went on to win the Munster final against Cork but lost the All-Ireland to a Tom Walsh inspired Kilkenny. In the same year Len had his first game for the MacDonaghs senior team against Thurles Sarsfields, in a tournament final on Easter Sunday. Toomevara thwarted his attempt to win a North medal when they had a two-point victory in the final. Len’s performances with the club brought him to the attention of the county selectors and in 1964 he made a winning debut for the Tipperary senior team, in the Oireachtas final against Kilkenny. Later in the year, he was on the Tipperary U21 team which defeated Wexford to win the All-Ireland final. Len was also a substitute on the senior team which had a convincing victory over Kilkenny in the All-Ireland senior final. For the next ten years he was a permanent fixture on the senior in the number seven jersey. Micheál O’Hehir described him as a “teak tough defender”. This quality, allied to his dashing style and quick striking, made him a firm favourite with the supporters of the blue and gold. As a juvenile and minor, Len had admired Tony Wall. In 1965 he had the honour of playing alongside Tony in the All-Ireland final, as the Premier county easily dealt with the challenge of Wexford. To crown a magnificent year, he captained MacDonaghs to a North final victory over Lorrha. In 1967 he gave an outstanding display in the All-Ireland final when Tipperary lost out to Kilkenny. Referring to the Tipperary defence, J.D. Hickey wrote in the Irish Independent: “As stated, Gaynor, even when opposed by Keher was the star of that department.” However, his consistent brilliance throughout the year was recognised when he was selected Tipperary Hurler of the Year and he also won a Cúchulainn Award, sponsored by the very popular Gaelic Weekly magazine. The Cúchulainn Awards were the unofficial All-Stars between 1963 and 1967. Len collected his third Celtic Cross in 1971 when Tipperary defeated Kilkenny. In the report of the game the Irish Press Len was quoted as follows: “It was the best match in which I have played and I am tremendously proud to win my third All-Ireland medal.” This fearless half-back last wore the blue and gold in a 1974 league game against Limerick. 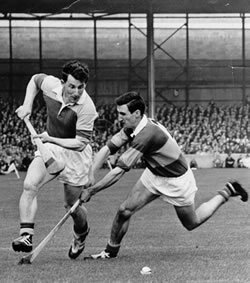 In an eleven-year intercounty career, he numbers Kilkenny’s Eddie Keher and Jimmy O’Brien of Wexford as his most difficult opponents. While giving sterling service to Tipperary, Len also made many appearances for Munster in the Railway Cup winning three medals in the process. Having departed the intercounty scene, Len devoted his energies and talents to his own club. As a trainer and motivator he had few peers. Len literally led from the front in the training field and asked no player to do anything he wasn’t prepared to do himself. His pre-match speeches and half-time rallying calls became the stuff of legend. Supporters thronged outside the dressing rooms to hear him deliver his call to arms. His message was clear and uncomplicated; the delivery was passionate and eloquent. Len never had to resort to smashing tables or depend on a flurry of expletives to get every last ounce of effort from his charges. In 1971 he coached the minor team to win the county final and he was the inspiration and driving force behind the U21 sides that won six North and four county titles in the seventies. One of the proudest moments of his career came in 1977 when he played on and coached the MacDonaghs team that brought the second county senior hurling title to the parish, after a lapse of seventy-five years. Len guided that side to a hat trick of county and divisional titles. In 1986 he brought the club to the pinnacle of success when the senior team, moulded in his image, won the All-Ireland club title against Buffers Alley, in what Paddy Downey of the Irish Times said was the best ever club final. Len’s qualities as a trainer and coach were also in demand on the intercounty scene. He was a selector on the Tipperary minor team which won the Munster final in 1973 and he filled the same role with the U21s in 1974. He was also a selector with the senior side in 1983, ’84 and ’86. In 1997 and 1998 he was manager of the Tipperary senior team, going within a puck of the ball of landing the All-Ireland crown with the ’97 side. Len was manager of the Clare senior team between 1991 and 1994, and even the most partisan Banner supporter acknowledges the crucial role he played in the rise to prominence of the saffron and blue. In 2006 was a selector on Tipperary U21 team that won Munster final and failed narrowly to capture the All-Ireland, losing a replay to Kilkenny. While Len’s first loyalty has always been to Kilruane MacDonaghs, he has also put his talents at the disposal of other clubs, but in doing so he never compromised his passionate allegiance to his own club. He trained Moycarkey (1982) and Clonoulty (1989) to win the Dan Breen Cup and he guided Shannon Rovers (1986) and Newport (1989) to county intermediate titles. He also steered Moneygall to county U21 hurling success in 1992. Although heavily involved in the coaching and training of teams, Len found time to be an active and effective club committee member. He was club chairman in 1995 and 1996, overseeing the opening of the stand in Thomas MacDonagh Park in 1995 and served a second stint in the chair between 2002 and 2007. Len was the club’s county board delegate for eleven years (2004-2014). His contributions in the boardroom were always incisive and generally decisive. Len commanded respect when he spoke with his eloquence and oratory were seldom matched and never bettered. Local and national radio availed of his services as a match analyst for intercounty games. Len was selected as left wing-back on the North Tipperary Centenary hurling team (1951-2001) and he was also named on the best ever farming hurling team in 2005. On Friday, 22nd April 2016 Tipp FM recorded a special “Down Your Way Tribute” to Len in a packed clubroom. A galaxy of former inter-county stars including Eddie Keher, Donie Nealon, Mackey McKenna, Tom McLoughney, Pat McLoughney, Cyril Lyons, Liam King, Sean McLoughlin and Mick Murphy were in attendance. In 2017 Len was honoured with a Laochra Gael Award and he was also inducted into the Nenagh Guardian Sports Awards Hall of Fame. In 2018 he was elected President of Kilruane MacDonaghs. After sixty-three years of selfless service to Kilruane MacDonaghs, Len is as committed and as energetic as ever, with his infectious enthusiasm a source of inspiration to every other member of the club. Honours won: All-Ireland senior (3); All-Ireland U21 (1); Munster U21 (2); Munster senior (6); Munster minor (1); National League (2); Oireachtas (4); Railway Cup (3); County senior (3); North senior (4); County junior (1); North junior (1); County U15 (1); North U15 (1); Dean Ryan (1).